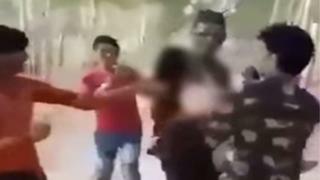 Indian police have arrested three men who allegedly molested two girls with their friends and posted a video of the incident on social media. It is not clear when the video was shot, but the location has been identified as Rampur district in the northern Indian state of Uttar Pradesh. A officer told the BBC that police were trying to identify other suspects. He added that the police registered a case after the video went viral on social media. Rahul Srivastava, chief spokesperson of the state police, said police were confident that the other suspects would be arrested soon. At least four men can be seen groping and abusing the women in the video while nine others watch. The men continue to molest the women and laugh even as they plead to be allowed to go. But violent sexual attacks against women and children continue to be reported across the country.